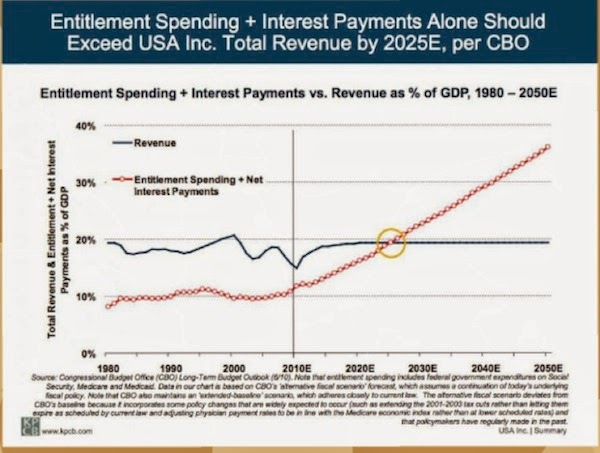 The chart below shows that by the year 2024 only two categories within federal spending, entitlement spending and interest payments, will consume 100% of annual revenue. 1. We will not enter a recession in the next 10 years. We are already over five years into the current expansion. The U.S. historically has entered into recession every 4 years on average. That means there will be no recession during the previous 15 years leading into 2024. 2. Interest rates will remain low. We are currently 32 years into the current bull market in bonds. Do you believe interest rates will continue to fall or remain at all time historical low levels throughout the next 10 years as record supply of new debt continues to enter the market? 1. Entitlement spending must be cut drastically and immediately. 2. The Federal Reserve will be forced to monetize (print money to buy) an enormous amount of debt during the next decade. I will let you decide if you think a politician will run and win an election over the next two years on the promise of reducing medical and social security payments (scenario 1). The situation above is the same one facing the entire developed world, not just the United States. Japan is even closer to their crisis moment, while the U.K. and most of Europe are ticking debt time bombs as well. 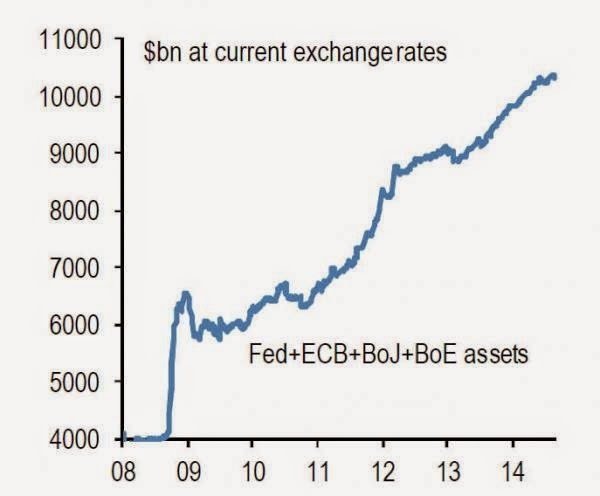 The chart below shows the money printed by the Federal Reserve, European Central Bank, Bank of Japan and Bank of England since 2008 has now crossed $10 trillion. This is only the warm up.